Burn-in is one of many common methods manufacturers utilize to sort out defective components during the testing process of electronic products. Burn-in test is normally conducted in the factory before shipment and after products are completely assembled. This process helps manufacturers weed out defective components and prevents defective products from being sold to customers. Burn-in test requires additional space for power supplies and its power consumption for a long period of time will increase energy demand. To tackle this cost challenge, GW Instek PFR series can easily assist manufacturers in solving all difficult problems. The PFR series provides better space flexibility in the limited test area by its 3U height (H:124/W:70/D:300 mm) and as light as a total weight of 2.5kg. Pertaining to power saving, the PFR series, a high-efficiency power conversion power supply, adopts high-efficiency PWM design comparing with low-efficiency linear power supplies. Hence, the PFR series is capable of saving electricity during long-time burn-in test. Comparing the same 100W output power supplies, the PFR series requires 143W of input power, while the linear power supplies with 0.5 efficiency require 200W of input power. After a full year of burn-in test, the PFR series will consume 1235 kWh and the linear power supplies will consume 1728kWh. For three years of burn-in test, the PFR series only consumes 3703kWh and linear power supplies consume 5184kWh. The PFR series is a five-fold multi-range power supply, which allows users to arbitrarily adjust voltage and current within the rated power. This function allows users to adjust the voltage and current settings according to the maximum output power. 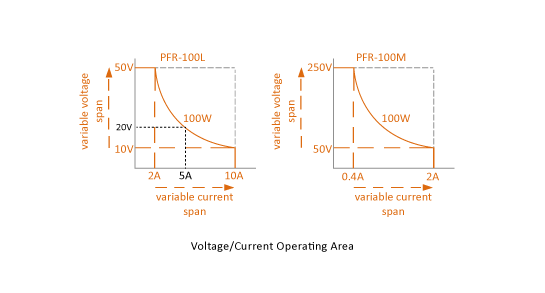 Compared with the conventional 100W power supplies with maximum output 20V/5A, the 100W PFR-100L provides a maximum output of 50V@2A or 10V@10A, and the PFR-100M provides an output of up to 250V/0.4A or 50V/2A. In terms of personnel operation, the Test Script function of PFR series edits sequential power outputs based upon customer’s burn-in test process and executes automatically during the burn-in procedures. Additionally, the built-in USB, RS- 232/485 communications of the PFR series allow testing personnel to remotely control or execute self-defined programs to realize automated tests and reduce manpower investment during burn-in process. For power supplies connected to the inside of the Chamber, the phenomenon of voltage drop is often happened due to the long wiring. The PFR series provides the Remote Sense function to compensate the voltage drop so as to ensure an accurate voltage output to the DUT. The operator does not need to adjust voltage for voltage drop. Conventional power supplies produce fan noise while in operation. Power supplies with fan design will absorb dust in the fan filter during long-term operation. The accumulated dust may affect the air circulation inside the power supply. Poor air circulation inside the power supply will cause the internal components of the power supply to function under a high-temperature environment. The components that work in the high-temperature environment for a long time will shorten the life cycle of the power supply. The fanless PFR series without fan noise is suitable for a quiet working environment, furthermore, fanless design is ideal for a clean and quiet test environment (e.g. clean room). The fanless PFR series can prolong its life cycle during burn-in test.